The new Kingston Nucleum USC-C hub is a good choice for users upgrading to MacBook Pro 2016 or later. To lighten and streamline their portable products, Apple is removing multiple ports and replacing them with USB-C ports. The newest MacBook Pros have USB-C ports, but no USB A (3.1), HDMI, or SD card reader slots. When choosing a new hub or dock, it’s important to note the different features available. Not all hub adapters have the card reader ports. The construction can differ also as there are models that attach directly to the computer or connect with very short cables. The Nucleum’s cable is sturdy mid-length and easily maneuvered into position. The Nucleum allows the use of older peripherals without purchase of compatible cables. 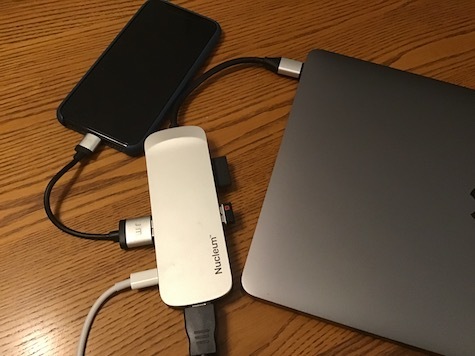 This hub has two Type-C ports (one dedicated for pass-through charging), two Type A (3.1) ports, an HDMI port, and ports for SDHC and microsSD cards. The Nucleum with its photo card ports is far superior to similar hubs that require a separate card reader. I have used both hub types and the Nucleum photo data transfer was considerable faster. The Nucleum was tested with an HDMI cable to 1020p and the display clarity was excellent. It also has capability for output to 1020p HD and 4K UHD. iPad and iPhone connection to iTunes for back-up and update installation. Can be used to add power to the iPhone during backup. Direct connection of printer to install software needed for wireless printing and scanning features. Transfer of digital photos and videos from a SD card. Peripherals without a Type-C connection such as an external CD/DVD player/reader. Its important to note that only one of the Type-C ports will deliver power from the MacBook charger to the computer. The unit is still usable without the power source, but then the peripherals are drawing power from the computer rather than the power source. Fortunately the Nucleum ports are labeled. 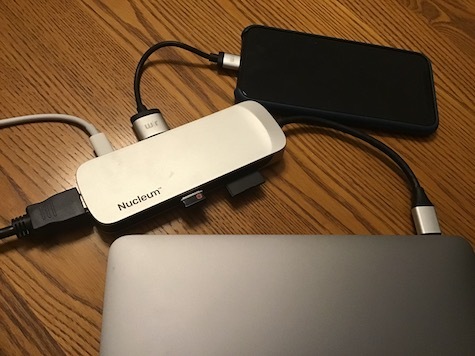 Not all hubs have labeled ports and some restrict the number of ports that can be used at at one time; the seven ports on the Nucleum can be used simultaneously. Travelers can use the hub for charging a phone without access to power. 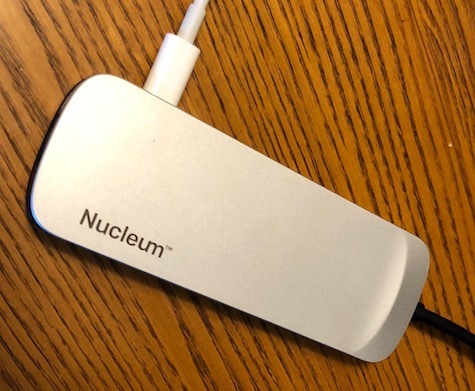 The Nucleum is an excellent choice among the small portable USB-C hubs. Rare 10 out of 10 MyMac Review Rating.